President Obama’s first major foreign policy address took place in April 5, 2009, in Prague, where he declared America’s commitment to pursue a safe and peaceful world without nuclear weapons. Several concrete steps were announced, namely the negotiation of a new Strategic Arms Reduction Treaty (START) with Russia to reduce both country’s warheads and stockpiles, the ratification of the Comprehensive Nuclear-Test-Ban Treaty (CTBT), the creation of a treaty to end production of fissile materials, and several other steps to strengthen the Treaty on the Non-Proliferation of Nuclear Weapons (NPT). On April 8, 2010, Presidents Obama and Medvedev signed the arms reduction treaty promised by the former a year before, and that would be described by the White House as a significant progress regarding their security, relations with Russia, and towards a world free of nuclear weapons. The treaty, called New START, constituted a pledge to reduce both country’s nuclear arsenals, and impose stricter limits on read-to-use long-range nuclear weapons. Replacing the Treaty of Moscow, signed by Vladimir Putin and George W. Bush in 2002, it is expected to last at least until 2021. On April 8, 2009, President Obama announced that he would fully participate in the P5+1 (the five permanent members of the U.N. Security Council plus Germany) talks with Iran, a decision that constituted a departure from the previous Administration’s refusal of involvement. On July 2015, the Joint Comprehensive Plan of Action, commonly known as the Iran nuclear deal, was signed between the P5+1 and the EU, instating a strict limit on the country’s nuclear ability for over 10 years, in return for a lift on international sanctions against the country. As admitted by Joe Biden on January 11, not everything that this Administration set out to do was accomplished. The CTBT remains unratified. Pakistan, North Korea, and Russia continued to grow their nuclear arsenal (the latter in violation of the New Start Treaty). Additionally, in spite of commitments to disarmament voiced in Prague, Obama’s efforts to reduce America’s nuclear arsenal have paled in comparison to his predecessors. According to the Pentagon, as of September 2015, the current Administration was responsible for less reductions in stockpile size than other in the post-Cold War period, even though stronger efforts have been made in that regard in the past year. Nonetheless, as the Vice-President pointed out, under Barack Obama’s leadership, the U.S. have continued to lead the global consensus regarding disarmament, reduced their reliance on nuclear weapons for strategy purposes, and invested on civil nuclear cooperation and non-proliferation. The Iran nuclear deal stands out amongst every other achievement on the field, hopefully putting to rest a crisis that has remained unresolved for decades. On January 16, President-elect Donald Trump proposed to repeal U.S. sanctions on Russia in exchange for a nuclear arms reduction agreement, as he emphasized the importance of reducing nuclear stockpiles. This statement represented a strong contradiction with several of his previous messages, since he claimed, on December 22, that his country must “greatly strengthen and expand his nuclear capability”. Additionally, he had already suggested back in March (and more than once) that other countries, like Japan and South Korea, should acquire nuclear weapons to be less dependable on the U.S. for security and defense – statements that he would later try to retract. In light of these incongruities, it is difficult to determine where he stands on nuclear disarmament, arms control deals, and to predict what will America’s nuclear policy under his leadership look like. In any case, this is yet another instance in which Donald Trump appears too eager to make an ally of Vladimir Putin. Throughout his campaign, the President-elect has expressed his disapproval of the Iran nuclear deal, threatening to scrap it immediately after taking office for not being tough enough. His criticism is nor unfounded. Ever since the agreement took effect, Iran has exceeded in two separate occasions its limits on heavy water stockpile, and the U.S. has hesitated in enforce Iran’s non-nuclear mischiefs (e.g. supporting terrorism, human rights violations) in fear of risking the stability of the deal. However, tearing up the agreement would harm America’s relations with his European allies, as well as Russia and China, and lead Iran to resume its nuclear enrichment activities after having already received a $100 billion windfall from sanctions relief. In the end, Trump’s posture might just be an effort to carve up a better deal with Iran, strengthen the leverage of the U.S., and reinforce control over Iranian non-nuclear activities that jeopardize the security of his country. While that might be the case, it can’t be forgotten how remarkable the Iran nuclear deal was, and how its renegotiation represents a risk to global security – which is why it must be made by all the parties involved in the agreement. Since, as Joe Biden explained, “good intentions rarely happen in international diplomacy”, it is unclear how much of Obama’s nuclear legacy will survive Donald Trump’s Administration. 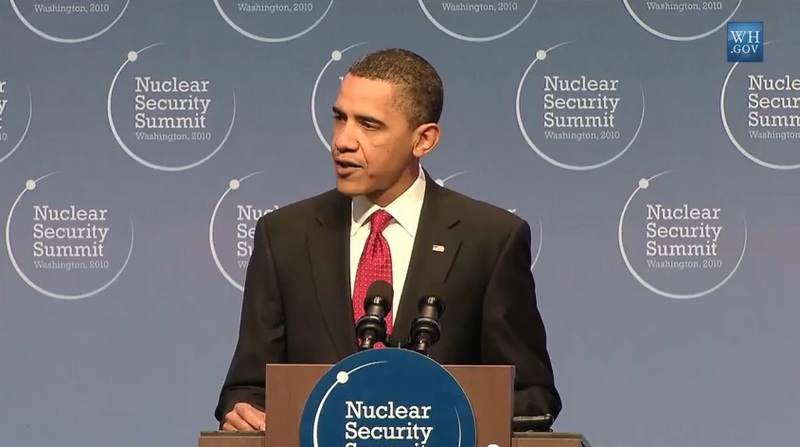 President Obama speaking at the Nuclear Security Summit, Washington 2010, Photo by The White House / Public domain.